In May, Nicole from Pretty Ruff Life was my featured blogger. You can read that post and see other past featured blogs under the "blog of the month" label! Being my blog of the month gets you a designated blog post, a sidebar button, and a mention on my Twitter account. The sidebar button stays up all month long. I don't believe in necessarily making bloggers pay for advertising and I'd much rather show you blogs that I really enjoy reading. And I hope you end up enjoying them too! This month's featured blogger is Stef from Beautiful Beakers! She is one of the more recent bloggers that I follow and I have enjoyed reading her blog and following her Instagram feed for the past few months. She bought an ad on my blog and I am so happy that not only she helped support a fellow blogger, but it also put her in my path. Stef is so sweet and supportive with every interaction. 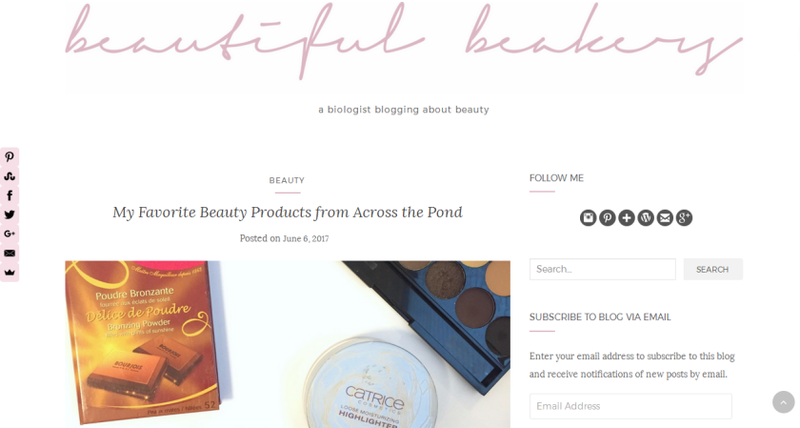 If you're mainly here for my beauty posts, you'll love her blog too. And can we talk about how I am still jealous that she saw the musical Hamilton?! If you check out her blog, feel free to let her know I sent you!